Ducati’s Ruben Xaus was fastest in qualifying on Friday for Sunday’s WSB opener in Valencia. His time was more than half a second under the fastest qualifying time set last year. Reigning world champion Troy Bayliss was second fastest with Aprilia’s Noriyuki Haga third, and 2000 champion Colin Edwards (Honda) fourth. The provisional second row is Ben Bostrom fifth (Ducati), sixth Hitoyasu Izutsu (Kawasaki), seventh James Toseland (Ducati), Neil Hodgson eighth (Ducati). 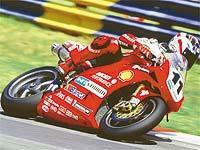 Chili was ninth quickest, also on a Ducati. Chris Walker was 14th quickest and Britain’s other hopeful, Mark Heckles could only manage 19th fastest on his kitted SP-2, after crashing during the session. He was unhurt but was limited to just 10 laps. Hodgson has been struggling with front end chatter, a problem the Spanish circuit is known to exaggerate. GET WSB news on your mobile this weekend. Text MCN WSB ON to 84004. Get at least five messages from our trackside reporter covering qualifying, Superpole, WSB and WSS results over the weekend for just £1. Only available on BT Cellnet (though not pay as you go) and Vodafone. More networks coming soon. Details? See full story and conditions in Racing or News. Don’t forget MCN Sport magazine; out on March 15.